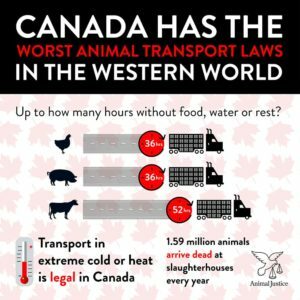 Home » Posts tagged with "eggs"
Slaughter report from Agriculture and Agri-Food Canada show we killed 771,625,940 land animals for food in 2016—up from 750 million farmed animals killed the previous year. The growth is mostly because more chickens than ever are being killed for meat. These numbers don’t even include aquatic animals, which the government only tracks by weight. It also doesn’t include thousands of deers, elks, and wild boars killed in Canadian slaughterhouses for which 2016 numbers are not available. These death statistics also don’t include the millions of male chicks killed at birth in the egg industry, the animals killed on farms by unconscionable euthanasia methods, and the animals who suffered to death before even reaching the slaughterhouse. As part of a food safety modernization initiative, the Canadian Food Inspection Agency is overhauling our decades-old slaughter regulations. Though it’s unsurprising that the focus of the new food safety regulations is food safety, it’s concerning that the welfare of the 750 million land animals we kill for food each year in Canada reads more like a footnote than an integral aspect of the regulatory scheme. In fact, the entire preamble that introduces the new rules (over 22 thousand words) discusses only food safety and economics. There’s not a single reference to animal welfare. Although suspending conscious animals will be banned under the new rules, an exception is made for birds—including chickens and turkeys—even though these animals are the vast majority of the ones we kill for food (97 percent). Conscious chickens and turkeys will continue to be shackled upside-down before their heads are dragged through an electrified vat of water. It’s not because these animals don’t suffer when hung upside down, their legs yanked into wedge-shaped metal shackles—they do. And it’s not because less cruel methods aren’t available—they are. Rather, it’s because the priority in drafting new farmed animal rules is industry convenience instead of animal welfare. The new rules also don’t address the serious problem of too many of animals being improperly stunned on fast moving slaughter lines. In practice, this margin of error means that animals are routinely drowned, scalded, or skinned alive. Aquatic animals are entirely excluded from the rules, meaning not a single piece of legislation regulates the welfare of fishes at slaughter, despite a growing body of science showing these animals are conscious and experience pain and fear. By contrast, in the European Union, fishes too are covered by the general rule that prohibits inflicting excessive pain and distress at slaughter. Like their predecessors, the new rules require animals to be unconscious before having their throats cut, but allow an exemption for ritual slaughter. The Canadian Veterinary Medical Association—as well as most transnational veterinary and animal welfare groups—opposes this non-stun slaughter for inflicting additional pain and fear onto animals. The new rules continue to permit electric prods. Covertly obtained footage has shown not only that these cruel devices are used to force injured and ill animals to walk, but that government inspectors have been present for such reprehensible conduct and failed to act. Government inspectors aren’t even required to always be on-site. When violations occur there’s a good chance nobody will be there to enforce the law anyway. The EU deals with the economic and practical difficulty of always having government inspectors present by requiring slaughterhouses to appoint Animal Welfare Officers on their own dime to implement animal welfare measures. As part of a worrying trend away from measurable regulations, the new rules are filled with vague terms like “sufficient space,” “avoidable injury,” and “sufficient ventilation.” These amorphous terms—termed “outcomes-based measures”—tend to be under-enforced to animals’ detriment. In the European Union, quantifiable and well-defined standards delineate clear regulatory boundaries. Updated labelling rules make it more explicit that the government’s priority is monitoring packaging quantities and ingredients. So-called values claims, such as “free range” and “grass fed,” will be left to industry to define—even if it misleads consumers. When it comes to food safety, the Canadian Food Inspection Agency demonstrates that it’s capable of creating rigorous standards—for instance, chewing gum is prohibited in any food packaging or animal slaughtering facility because evidently it risks contaminating food. Yet, the new slaughter rules lump living animals together with inanimate food items, sidelining even their most fundamental interests to the most trivial of ours. There is a growing awareness that animals—including farmed animals—are sentient individuals with rich emotional lives. Fortunately, it’s not too late to demand better for these animals from the regulator. The public is invited to submit comments on the draft rules until April 21st, 2017 to CFIA-Modernisation-ACIA@inspection.gc.ca.